NHS Operational Planning and Contracting Guidance provides local NHS organisations with an update on the national priorities for 2017/18 and 2018/19, as well as updating on longer term financial challenges for local systems. 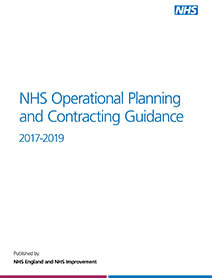 NHS England and NHS Improvement have published this year’s operational and contracting planning guidance three months earlier than normal to help local organisations plan more strategically. For the first time, the planning guidance covers two financial years, to provide greater stability and support transformation. This is underpinned by a two-year tariff and two-year NHS Standard Contract.